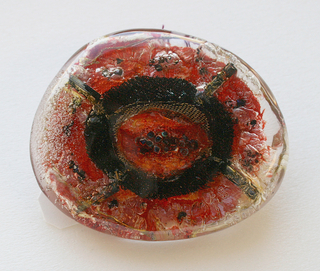 See more objects with the tag bracelet, polyurethane. This is a Invitation Bracelet. It is dated 1999 and we acquired it in 2016. Its medium is polyurethane resin. It is a part of the Product Design and Decorative Arts department. 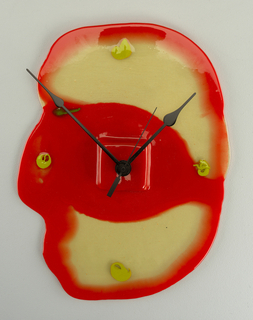 Industrial designer, Gaetano Pesce, has explored the use of resin for objects ranging from furniture to vessels. Pesce doesn't 'push' the material to follow his whim, but lets the flow of the resin determine the final form. The flexibility of this colorful, curvaceous invitation/bracelet to a show of Pesces's work at Columbia University allows it to be wrapped around the wearer's wrist, to become a wearable memento of the event. Gift of Armand G. & Barbara L. Winfield Archive.